It was the Buddhist nun and travel writer Alexandra David-Néel (1868–1969) who brought the manuscript “Illuminator, a Light of Gnosis – The Great Commentary on The Single Intention” by Dorje Sherab from Asia to France. The German foundation Garchen Stiftung reproduced the precious manuscript in its original size and colors. 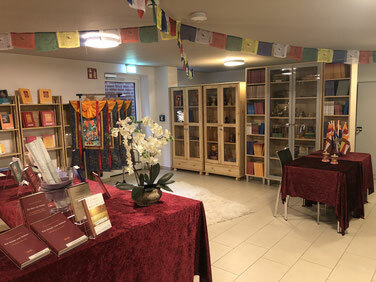 Thus the work is available to an audience of traditional and western experts as well as students of the Tibetan language. Reproduction Page Size: 42 x 29,7 cm | 16.5" x 11.7"
Page Size of the Tibetan Manuscript: approx. 38 x 10,5 cm | 15" x 4.1"
Size: 44 x 33 x 3 cm | 17.3" x 13" x 1.2"
Matthew T. Kapstein, whose study of the event is reproduced here for the first time with color photographic documentation, is the author of many works on Buddhism and Tibetan history, including The Tibetan Assimilation of Buddhism and The Tibetans. He is Director of Tibetan Studies at the École Pratique des Hautes Études, Paris, and Numata Visiting Professor of Buddhist Studies at the University of Chicago. “Mountain Dharma” is a genre of Buddhist texts providing practical instructions for conducting solitary retreat in the mountains or other remote places. "The Inexhaustible Source of Nectar" collects sections from seven Mountain Dharma teachings given by Drikung Kyobpa Jigten Sumgon, the founder of the Drikung Kagyu lineage, and written down by his student On Sherab Jungne. Here Kyobpa Jigten Sumgon shows himself to be a master of dependent origination. He extensively considers activities of body and speech as well as mental attitudes, and he precisely specifies how they affect a retreat positively or negatively. The English translation is followed by the Tibetan text in full. Chenga Sherab Jungne, Scintillation of the Precious Vajra, The Life Path of Complete Liberation of the Dharma Lord Jigten Sumgön, With the biography of the author "Roaring Thunder of Fame"
The public teachings of Jigten Sumgon (1143–1217), the founder of the Drikung Kagyu lineage of Tibetan Buddhism, are a source of wisdom. He not only explains the pure offering and pure dedication, the philosophical main features of the Kagyu school, and the four yogas of the Mahamudra tradition but also the vajra body, the practice of channels, chakras, and winds, the responsibility of the disciple, and much more. Won Sherab Jungne, a heart son of Jigten Sumgon, took notes on these public teachings and commented on them. Finally, Dorje Dragpa, the fifth lineage holder of the Drikung Kagyu transmission, compiled them in the present form. Konchog Norzang, Tara Wisdom, "A Bouquet of Blue Lotus Flowers" That Elucidates Kyobpa Jigten Sumgon’s "Seven Supplications to Tara"
Lapchiwa Namkha Gyaltsen (1372–1437) was considered an incarnation, or at least emanation, of the Lord of Yogins, Jetsün Milarepa (1040–1123). However, for all the exemplary life that he led, he is virtually forgotten today, like other great masters. And if a very few remember him at all, it is mostly as a Drigung Kagyü master, even though he was an eminent lineage holder and practitioner of the Karma Kagyü, Shangpa Kagyü, Rechung Nyengyü, and Sakyapa teachings and practices as well. Certainty regarding appropriate conduct is crucial in all stages of the Buddhist path – specifically, knowing which actions are prohibited and which are encouraged. This book provides guidelines for the practitioner who has taken the vows of the three vehicles of Tibetan Buddhism. Here, Jigten Sumgön (1143 – 1217), the founder of the Drikung Kagyu school of Tibetan Buddhism, and his guru Phagmodrupa (1110 – 1170) answer the question: What does it mean to take the pratimoksha, bodhisattva, and Vajrayana vows? The "Gongchig," by Jigten Sumgon (1143 - 1217) is regarded by practitioners as their tradition's most important and at the same time most difficult text. The Eighth Karmapa even went so far as to praise it as the "Doctrine of the Kaygupas," and many westerners with an interest in these teachings have been waiting for years for a translation. Now, for the first time, the Drikung Kagyu Institute's translator training program has made available a German and English-language translation of the root text and Chokyi Dragpa's (1595 - 1659) precise commentary. This edition also renders the texts accessible to readers with little background in Buddhist philosophy. All of the Tibetan source texts are included as well. In his work Engaging by Stages in the Teachings of the Buddha, the great Tibetan master Phagmodrupa (1110-1170) sets out the Buddhist path with the utmost clarity. For the first time, this seminal treatise is now available in English. Phagmodrupa illustrates the sequential stages of entering the Buddhist path: placing trust in the spiritual tutor, taking refuge, meditating upon love and compassion, and attaining the three bodies of the Buddha. A biography of Phagmodrupa, also contained herein, provides insight into the life and work of this important master.